Hi everybody! Hope you guys are having a great week because I am! 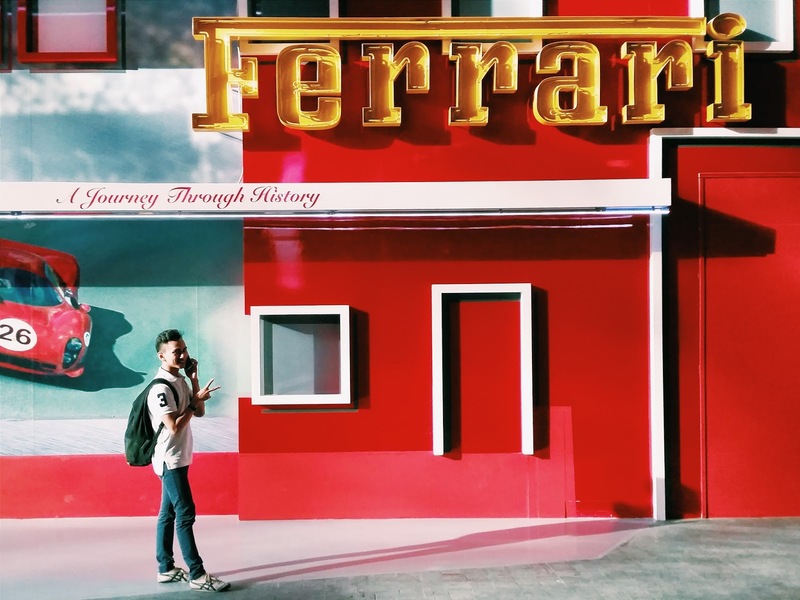 I have tonnes of things to do this week which I had religiously jot down in a list so that I will not forget and sharing everything about Ferrari World Abu Dhabi is one of them. 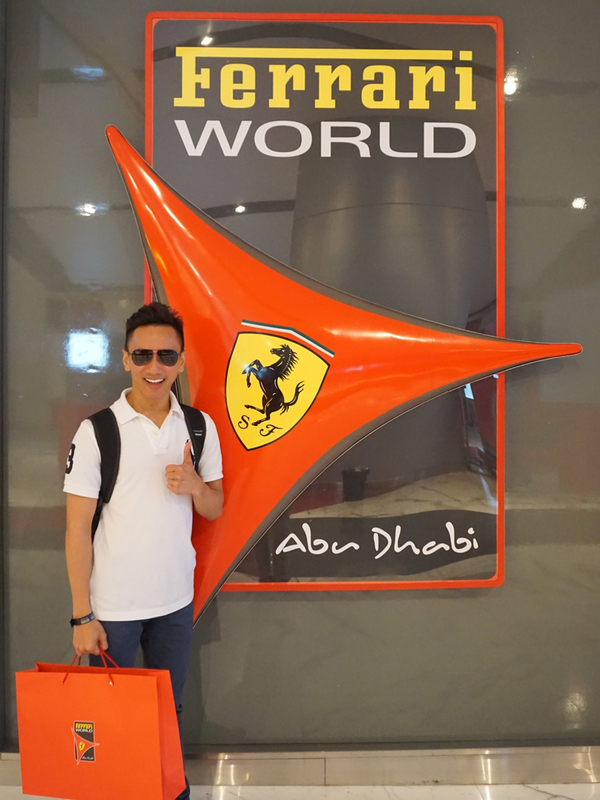 Ferrari World is the bomb! There were so many people during the holiday and it almost felt like the whole world was there which makes everything more happening, and excitingly kickass. 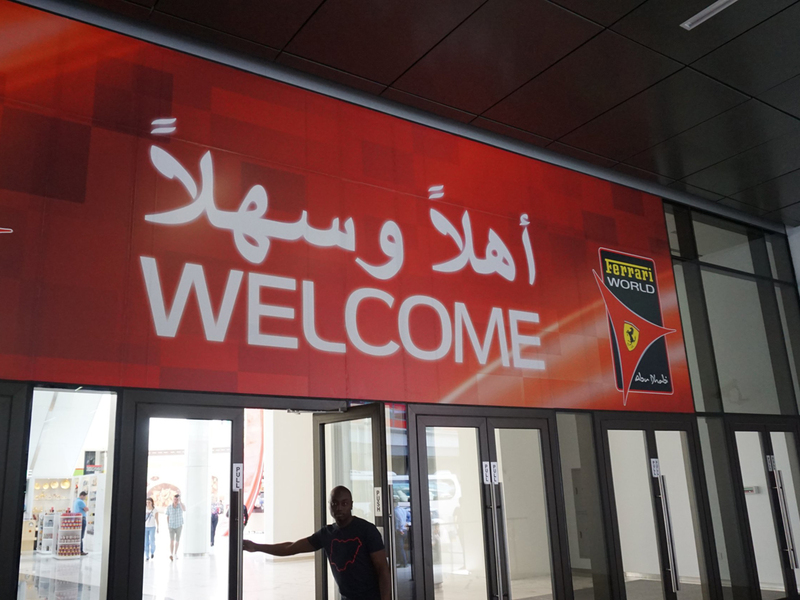 Ferrari World to date is the largest indoor theme park in the world and if you visit Abu Dhabi without setting foot inside Ferrari World, it is something that you would probably regret soon after because there's only one Ferrari theme park and it's right in Abu Dhabi. You will be delighted to know that you will not burn in the desert heat, because everything is indoor with exception to their coasters, that protrudes out. So the minimum time you'll be exposed to the sun is only about four minutes assuming those two coasters take two minutes each. It's quite safe to leave your sun block at the hotel if you are going to spend the entire day in Ferrari World which I would recommend! 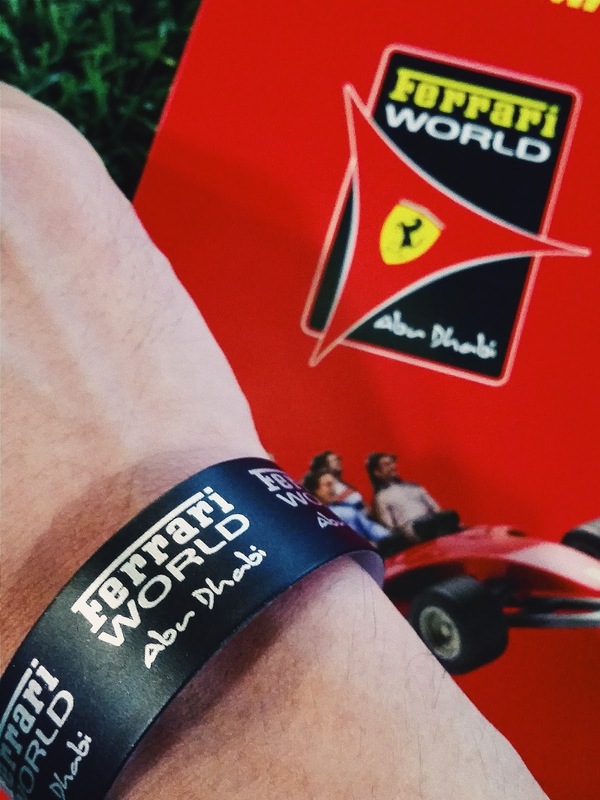 There were so many good things I picked up at Ferrari World Abu Dhabi that I feel it should be shared for the benefit of theme park fanatics! I love going to theme parks, you name it. Universal Studios, Ferrari World, Disneyland, whatever. Put me on a roller coaster ride and I'll probably be the happiest kid alive. I am definitely an adrenaline junkie and I am sure most of you are! 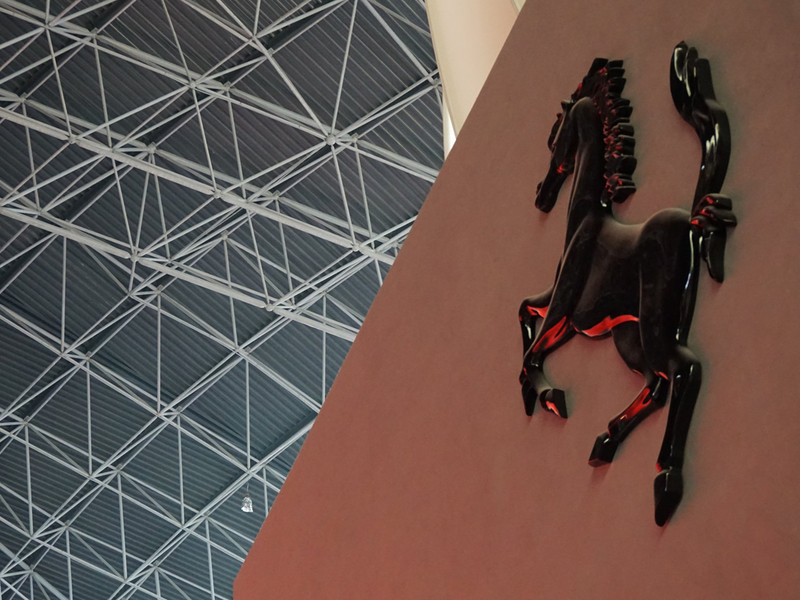 Even if you're not, I swear there's something for you to do in Ferrari World. So here goes, how to survive Ferrari World in a worst case scenario - peak period! This includes breakfast before heading to Ferrari World. The theme park opens at 11am and if you intend to be there early for breakfast, odds are some of the shops in Yas Mall will not be open yet. So have a heavy breakfast at the hotel, because you will spend entire day running around and you wouldn't want to go for a ride with a stomach too full. That would be disgusting and probably the least intelligent thing to do. Ethically! Being early has its perks too because if you do not buy their ticket online, you would want to be the first in the queue. I was there at 11.30am and the queue was so long I would give up queueing. I was really grateful for the advance arrangement. It would be better to buy their tickets online here early so as to avoid the massive queue. I'd suggest getting the premium pass too and here's why. 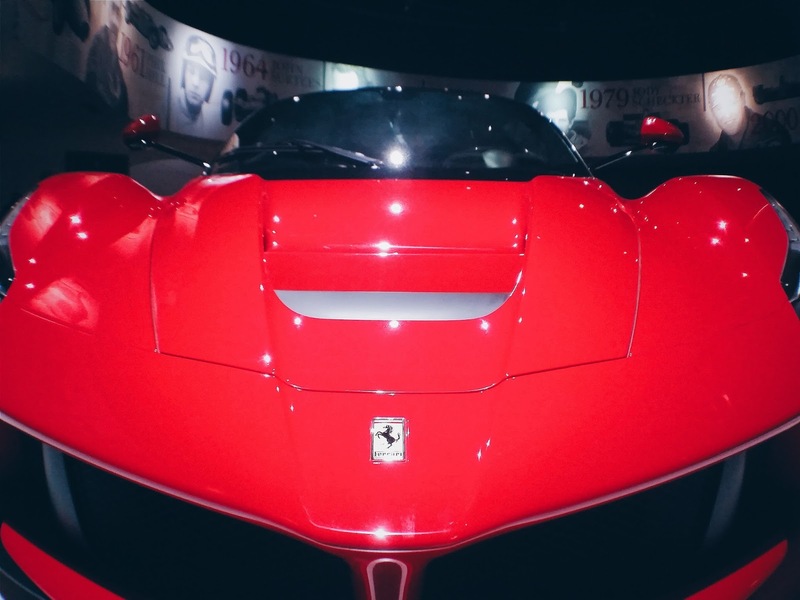 With more than 20 rides in Ferrari World, it is hard to pick only a few because you would want value for every dime spent. Getting the premium pass here costs less than double the standard ticket. While 80% of the buyers buy the standard tickets, the amount of queuing time for a premium pass holder is significantly shorter compared to a standard pass. Which cuts your queuing time more than half. 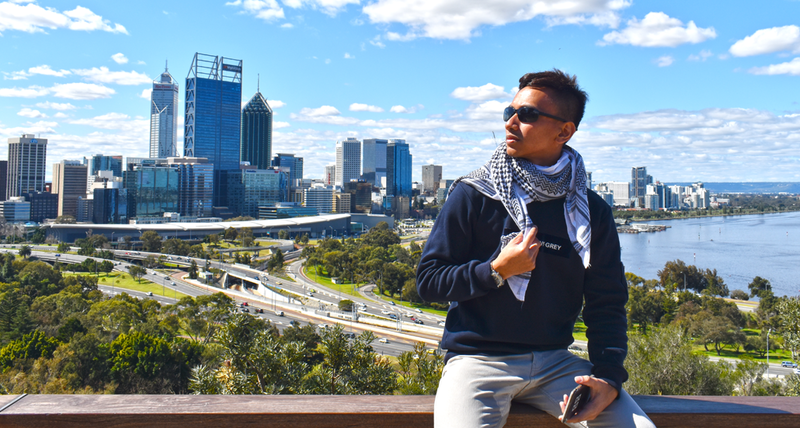 I am the type of traveller who relies on map although not all the time, because I like exploring places but I do not like getting too lost. The park map is so useful in giving you a sense of direction, giving an idea of where you stand. The park map helps you to be strategic because in it lies the key to getting to try all the rides. A handful of the rides are scheduled so you really need to plan where to go first. Very handy for especially when I only had seven hours or so in the park. 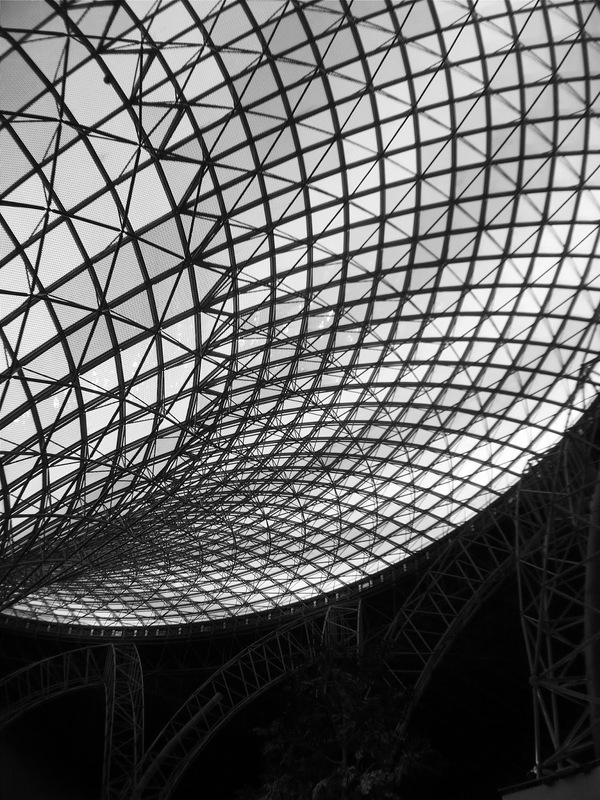 It is all the more essential in times to come because they are adding more rides. They give me a reason to be back in Abu Dhabi! Heard there will be 3 new rides and 1 new roller coaster? We'll see! 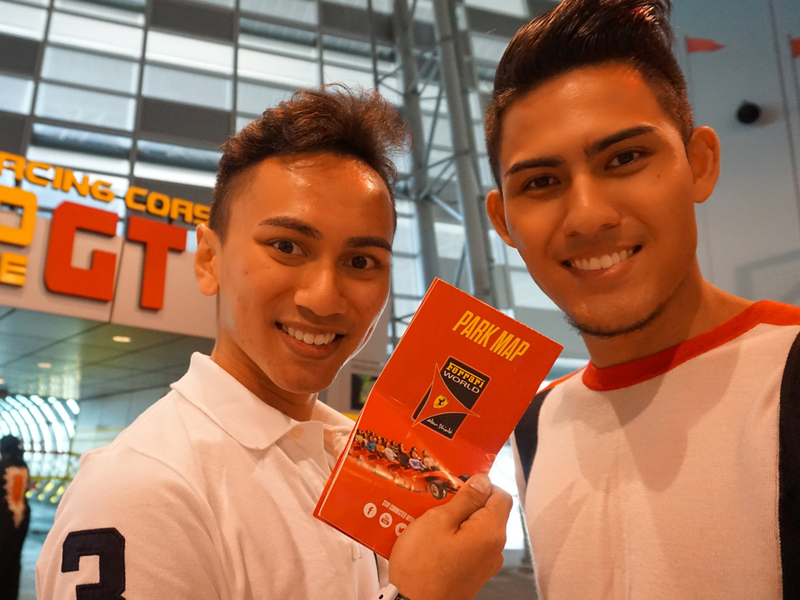 Here's how you can plan your journey (probably the most important part of this entry!) 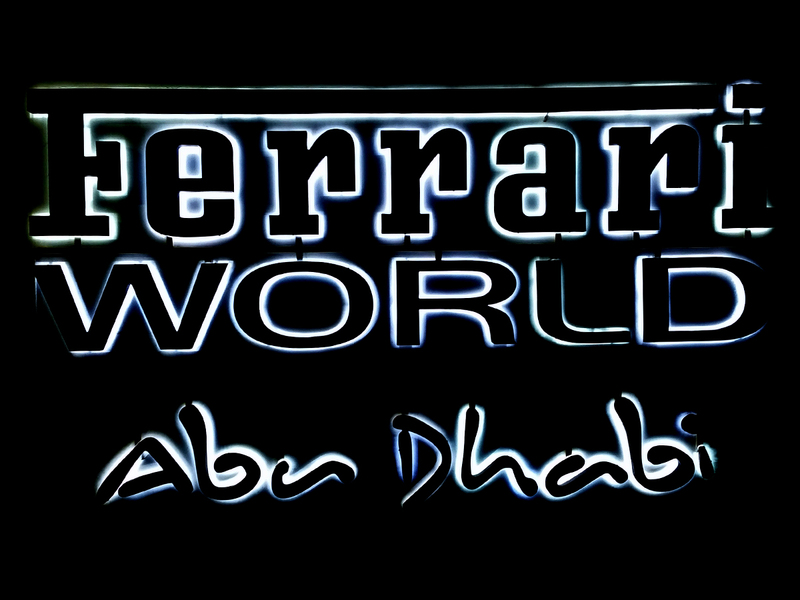 - given by the Ferrari World insider, check out all the scheduled rides and attractions first. First before anything else, find out the the timing for these rides as some of them require individual ticketing slip. This is also the reason why you have to put on your good shoes because this requires you to round the park first and fast! 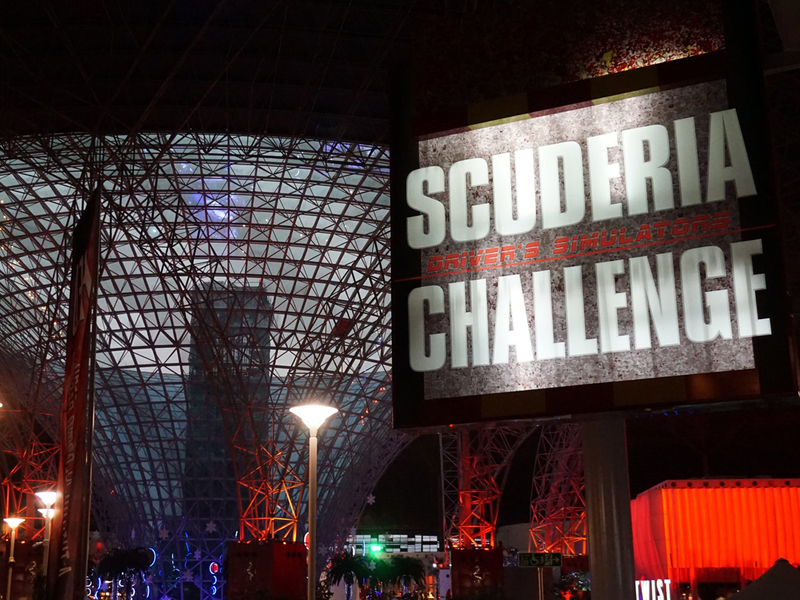 Scuderia Challenge - They are the ultimate state-of-the-art racing simulators on a variety of Ferraris where you can race alone or with a group of friends. The ride ticket is times so once you got the slip of ticket, take note of the timing. I don't know, set an alarm or something! I almost missed mine because I was so engrossed with other rides! Haha! Karting Academy - The academy tests your racing skills on their in-park go-kart racing track. Like Scuderia Challenge, their queue management is the same. What's special about this is that it requires a photo of your face and your name because your timing for the race will be shown just like what you see in grand prix. 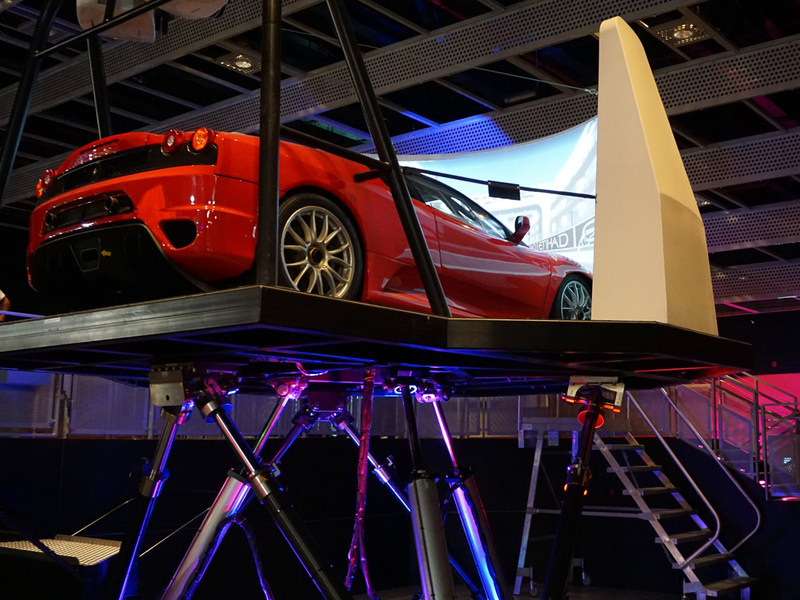 Fast Lane - It is an interactive game show to test your Ferrari knowledge. The champion gets a prize and be crowned as the Fast Lane Champion! 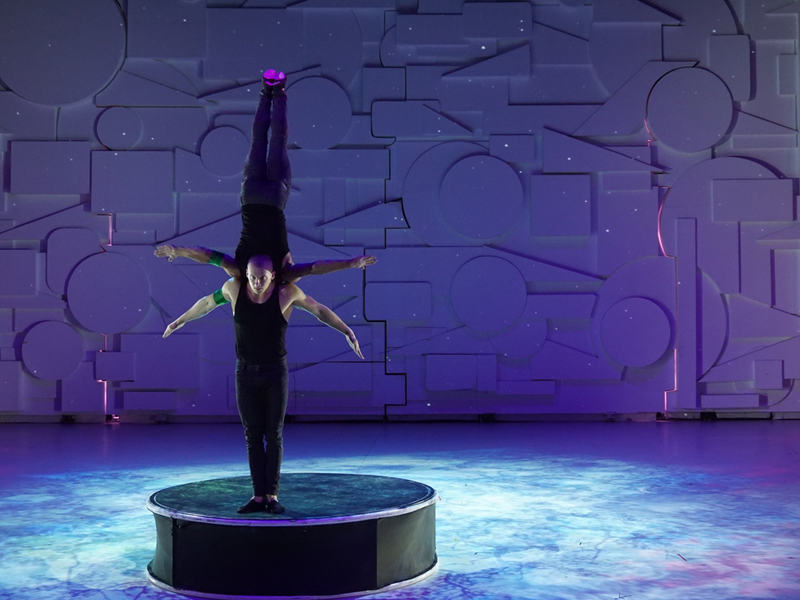 La Piazza Show - Live wholesome comedy magic show. Cinema Maranello - It is a short film screening, produced exclusively for Cinema Maranello that depicts the glamour and brute strength of the Italian road race Copa di Sicilia dated back in the 1920s. 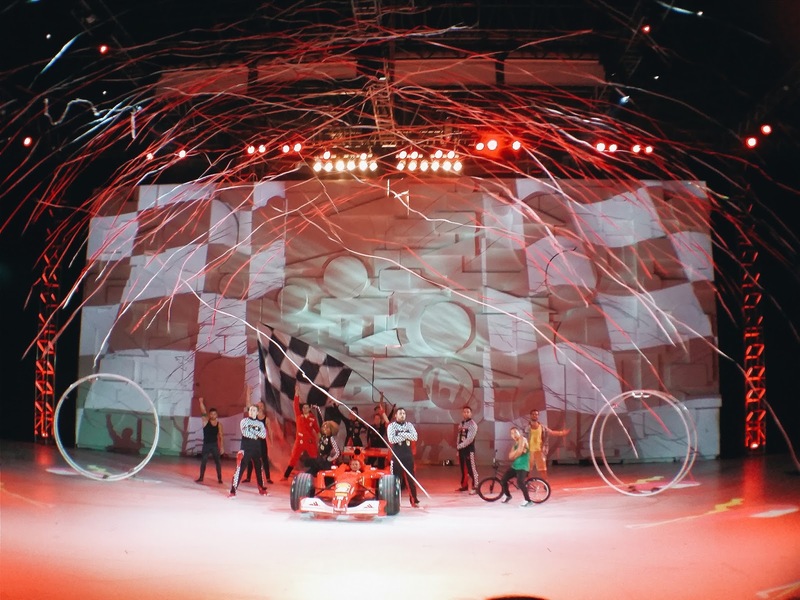 RED - Not referring to Taylor Swift's RED tour but Ferrari's in house spectacular theatrical show of speed and passion! 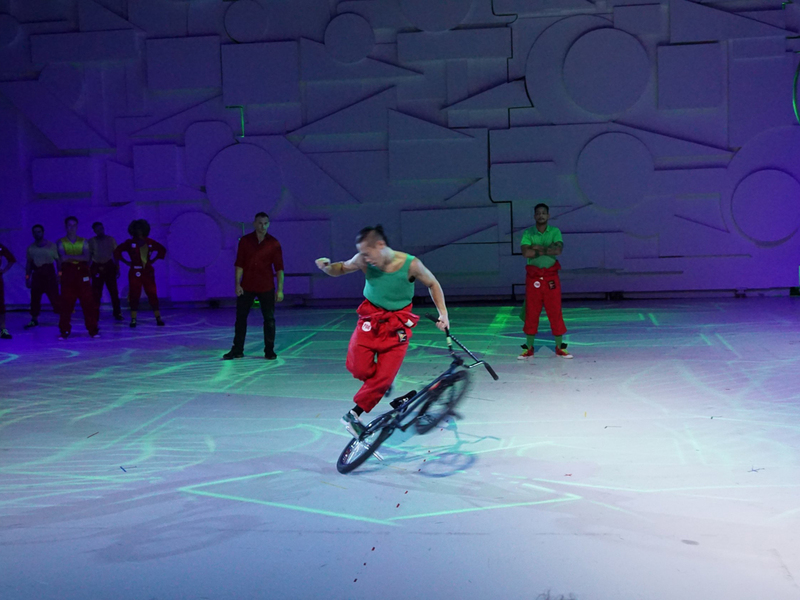 The show was inspired by Enzo Ferrari's passion and his love for speed, style and everything Italian. It's like watching a circus show less the animals with all the stuntmen and women playing their part showcasing their agility and fast movements. It was impressive really to be able to do such things. I would probably break into pieces. Haha! Then, once you are done sorting the timings for the rides and shows, go for the rest of the rides. Beginning with the shortest queue of course! On a busy period, most rides will have a long queue, even the slowest ride like Bell'Italia - slowest moving ride for kids did not escape from it. To some it wouldn't matter though because they're more focused on adrenaline pumping and heart racing rides only. 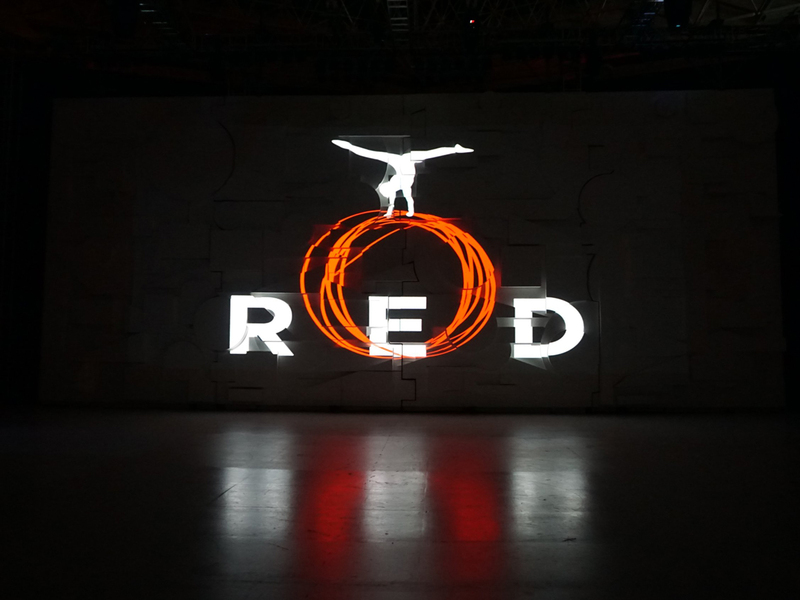 So for those who're adventurous like me, you'd look out for these two which are located at each end of Ferrari World. 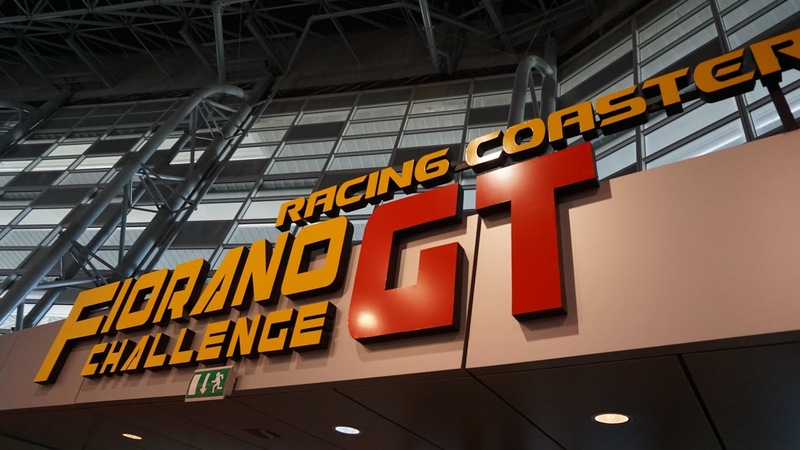 Fiorano GT Challenge - This duel coaster is concepted from the Ferrari F430 Spider as two competing coasters to reach the finishing line. Glad to be on the winning coaster! You've got try for yourself to see which is the faster one. Formula Rossa - The most popular ride in Ferrari World! Goes without saying it has the longest queue stretching way out from the queuing point. What you see in the picture below was not even a quarter of it. 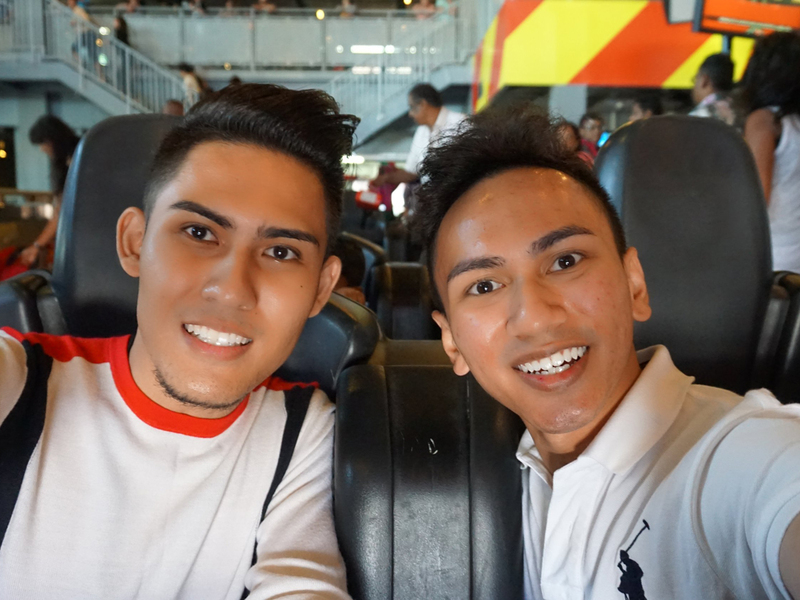 Formula Rossa is all about speed! 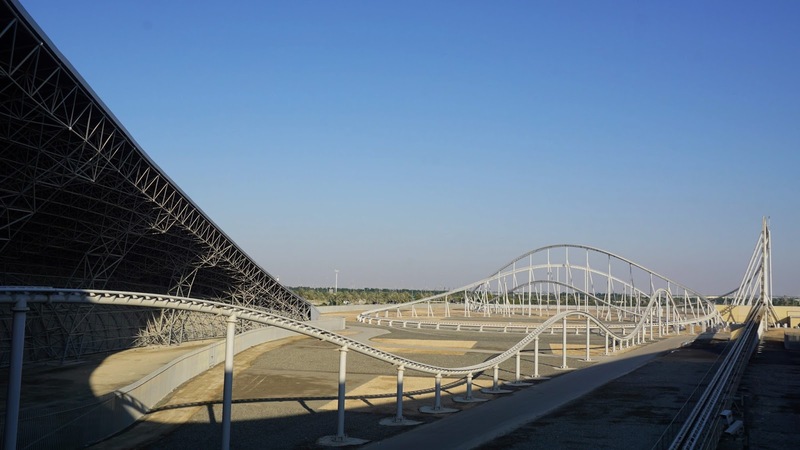 This is to date the fastest coaster in the world! 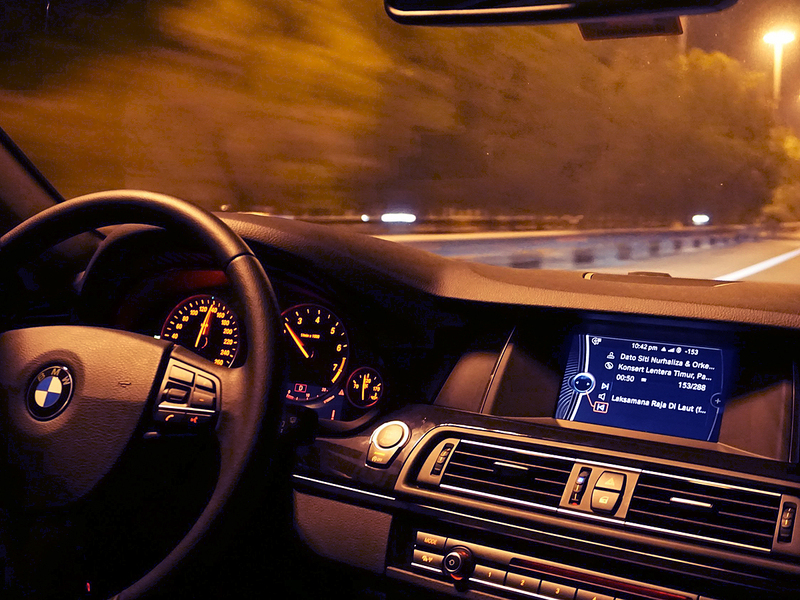 It reaches its top speed of 240km/h in five seconds that the G-force felt instantaneous. Like there was no preparation for it! I almost felt disappointed because of my limited time left Abu Dhabi and the long queue, I didn't think I would make it for Formula Rossa. Yes, I almost felt like crying and that was how much I really wanted to be on that coaster but the queue was so long even with premium! Its estimated time was two hours and no where on Earth I am going to let it go by without going for other rides. The worst part was to find out the coaster broke down. 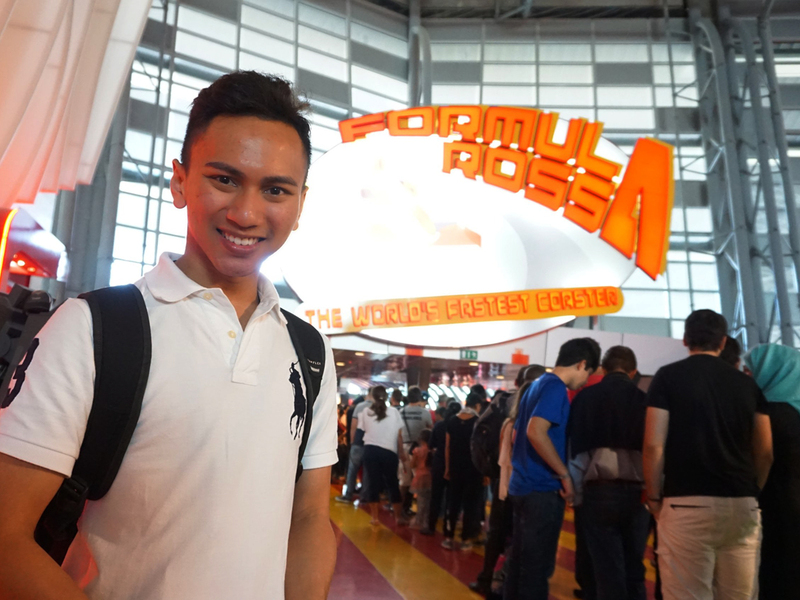 I almost gave up and no way I want to go back not having a story to tell about Formula Rossa. I was proud of myself for being patient after that because the ride was back in no time! Ferrari technical staff were so efficient. 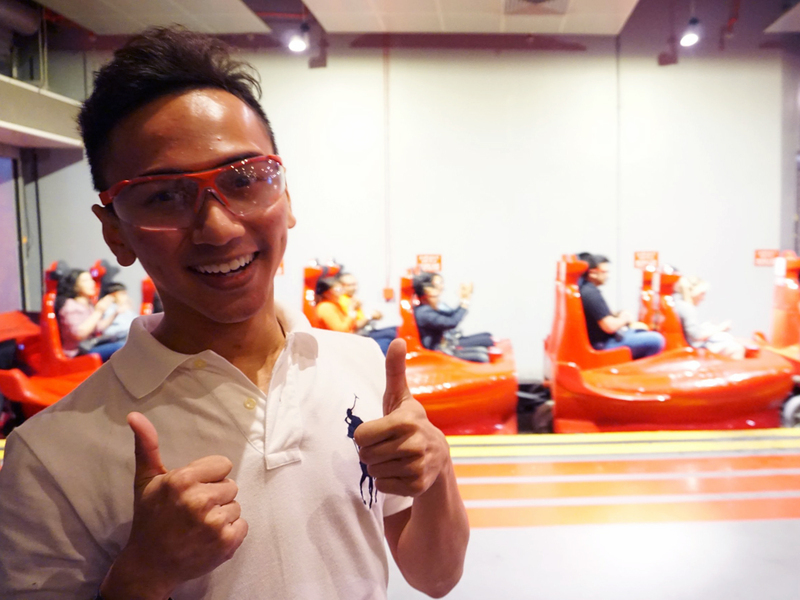 Can you imagine the number of people who wants to ride Formula Rossa? 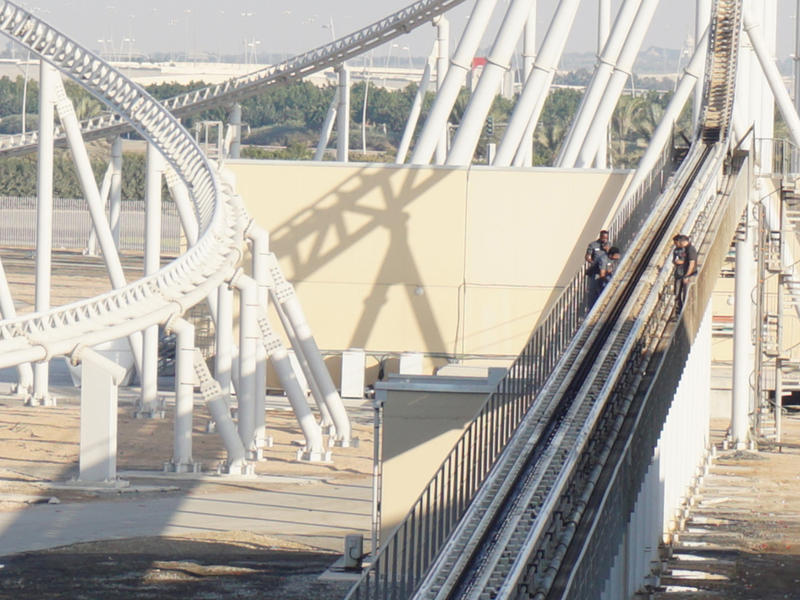 It's no wonder Formula Rossa needs a short rest before resuming work. My ride was so funny because the first time we were on it, Amin's goggles came off. We were so sure we put on our goggles tight but realised his eyes were bare when we docked. Oh and no hair gel can rescue you from the hair displacement. Don't even bother! The goggles are important because of the speed. Dust, insects and other particles may get into your eyes. If you can't imagine how fast it went, imagine our faces rippling due to wind the speed caused. It even happened to F1 racers Kimi Raikkonen and Fernando Alonso when they rode Formula Rossa! Leave some time before you leave for sightseeing, food and shopping and shopping. Okay, not exactly a green scenery for you to see but they have a display of beautiful vintage Ferraris that you can know about. If you are there for the sake of being there but not the rides, then indulge yourself in their fancy Italian restaurants like Ristorante Cavallino or Mamma Rosella that dishes up excellent Italian and Western dishes in stylish set up. 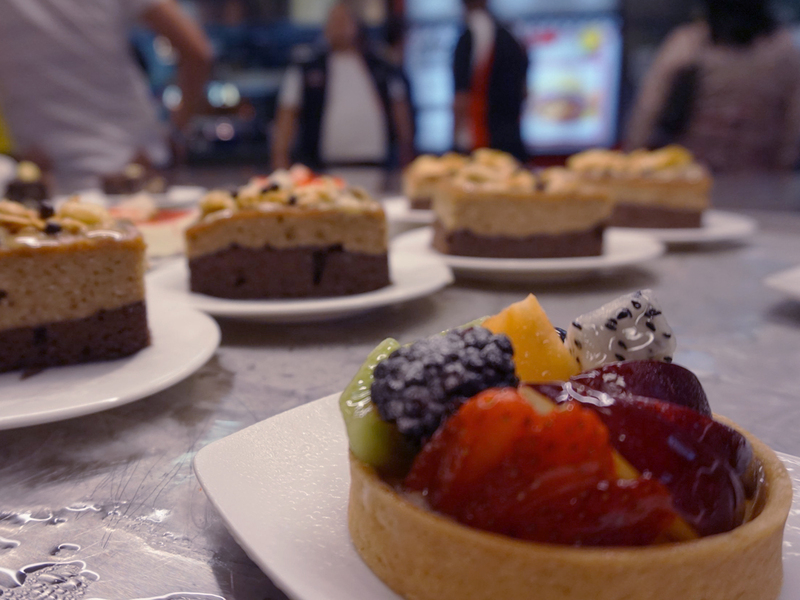 Their concession stands offer Italian delights like pastries, cakes and gelatos if you're in for a quick bite before you move on to the next activity. Shopping wise, your black card really gotta work because Ferrari merchandises are considerably pricey to some but the quality is superbly Italian. The stitching and material for their items are beyond this world. It says a lot about Italian quality. If you were to ask me how was I, I would say still surviving! That was just half of the trip done and the other half to go. 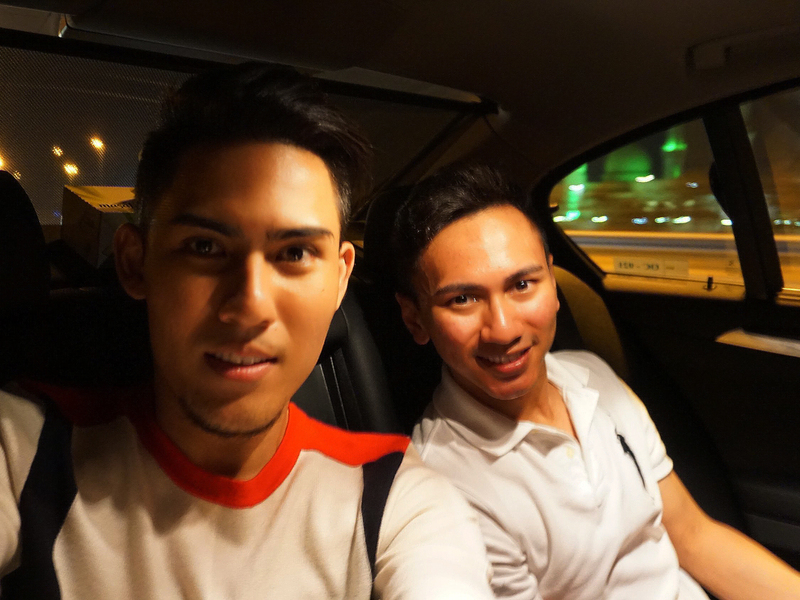 I was so tired I decided we should get a comfortable car instead of going back to Dubai by cab. I need my jam and cosy leather seat to stay excited and awake otherwise I'd probably fall to deep sleep in a cab before reaching Dubai. After all that ride in Ferrari World, I cannot afford to get car sick! Once we reached our hotel in Dubai, I quickly unpack to prepare for the following day - which was countdown. I was quick to fall asleep really. Haha! Alright, see you guys! Have a good week ahead!